I am looking for a flight search engine that includes a luggage calculator in the price. I recently booked a trip and had the choice between two carriers at the time, and not feeling very stupid I chose the cheaper one. The crux is that after I had paid I found out that the more expensive airline had vastly different rules for baggage. In fact it allowed twice the amount of baggage without extra charge. After having found the price for extra luggage very extreme I had already decided I will send the extra baggage as separate freight, because the speed is not important. But of course had I known this from the start I could have saved myself a lot of work and money. I am aware that this information can be found on respective carrier website, but even within a single company it can differ from route to route. Would be handy if I didn't have to try and calculate it all myself. So my question is simply, is there any flight search engine/price comparison site where I can also enter my total baggage needs to have it included in the price comparison between carriers? Sort of. You could use FlightFox which allows you to specify your terms (date, cities, etc) and one of the options is whether or not you have baggage. It's up to the experts on the site then to find you the cheapest WITH baggage. I did this recently for several flights around NZ/Aus, where there are airlines like Virgin or Jetstar, all of whom charge extra for baggage, so look cheap at first. Each of the experts that submitted flights to me all correctly took this into account, and specified that they'd done so. So it seems pretty reliable. Of course, being done by humans and not computer, caveat emptor and all that, you should still double check yourself. note - around this time I actually joined Flightfox as an expert 'flight hunter'. This question is five years old, so the "state of the art" may have advanced significantly for lots of engines, but I've noticed that at least Kayak allows you to specify how much baggage you have. Unfortunately, it doesn't mention in-flight meals, which is another way they can slug you. 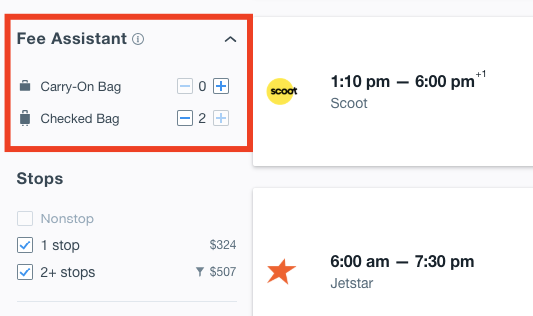 Note: As of 2019 this feature works on Kayak.com, but not on some of their other international sites. Carry-on policies change all the time (I gave you three airlines changing within two weeks of writing of this answer). You would need a crew constantly being on top of every airline you can search for. For added fun, you'd need to surface priority fares because they very well might be cheaper than buying this or that alone -- or sometimes there's just no other way to have this or that except by going priority, personal items especially. The existing enormous computational complexity of putting together routes now gets even more complicated. Not to mention that people might adapt. Say, Wizz's previous policy required you to pay for a large cabin bag. Maybe you reconsidered what you planned to pack when you saw that but how would the search engine ask you whether you really want to bring that item on board? Yes, in my dreams I would be able to enter all my viable bag combination and let the engine do the work... this is not feasible. Doesn't allow to enter your luggage mass in the search form, but at least you don't have to visit each carrier website to find out. Not the answer you're looking for? Browse other questions tagged air-travel online-resources luggage flight-search-engines or ask your own question. Where can I compare airfares *including baggage fees*? Can I find better flight options than those on search engines? Why are there price differences between country sites on flight search engines?